Summer started off super nice with working site specific at a unique place called Nääs Fabriker, an old textile factory area in Nääs/Tollered, Sweden. During one intense week, my work was taking form and developed from one idea to another. 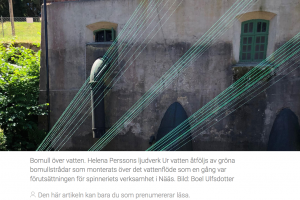 In this exhibition, the installations and sound pieces has their starting point in the historical significance of Tollered, Sweden. Nine sound artists from Finland, Norway and Sweden are invited to work on spot with their installations the week before the opening. The aim is to emphazise the relevance and history behind the textile factory that characterize the area even today. For this special occasion, I found one magic spot that attracted me more than others. 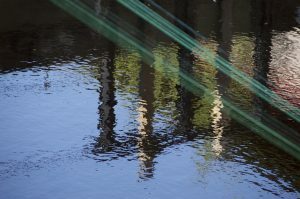 I started to work with the sounds from the area along with the systematic work of putting up threads, one by one, coming out of the water and reaching the fasade of the old electric power station of the upper part of the village. The piece is called Ur vatten (Out of Water) and you can see all the sound works during the summer. Heidi M Wee and Kimmo Modig, Finland, Yngvild Færøj and Siri Austen and Sössa Jörgenssen, Norway, Helena Persson, Sweden, Hannes Nilsson, Sweden, Dan Fröberg, Sweden, Mikael Bojen, Sweden and Rickard Widerberg, Sweden. The exhibition is open June 15 – Aug 12, Fri-Sun, 11 – 16 pm. You are currently reading Nordic Sound Art Exhibition at soundSibling.